Submitting to dAhub 's Go Green Contest! So I was a little less detailed with this picture to put more of an emphasis on the upper portion of the body. I may change my mind later and add more details if it bugs me too much. I kinda like how the galaxy space haze looks kinda like lightning. Plus the watercolors did some nice "fanning" out that also kinda looks like lightning. Oh how I love happy accidents! I chose the word "essence" for Jupiter because it's an airy-fairy word that can include the essence of lightning (which she uses as a sailor senshi) and the essence of flowers (she's also a gardener/cook, etc). Btw "Essence" is one of my favorite words of all time. Also....Jupiter is a combination of femininity and masculinity so essence also portrays that without a gender bias or calling her a tomboy. Essence. Yes, I love this. It's so her. Got all of the Jupiter elements here, lovely work! Yay Makoto with flowers!!! She looks lovely. ^^ I figured it would be either baking or florist, since Makoto dreams of having a flower and bakery shop, plus she's seen cooking! But your choice of the flowers is spot on! I actually wanted to do something a little more non-object/power oriented as a talent for Jupiter. Typically yes, Jupiter is known for Thunder/lightning, baking/cooking, and botany (growing plants). So I went with flowers because it's mentioned more in the Manga (or at least in the Supers part of the saga). ^^ Well like I said, it's a really great job you did! Essence is such a neat word, ne? Whoa...... I really do like the white on the dark green! Definitely draws attention! 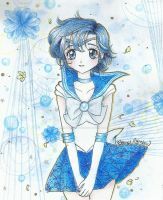 You also used this title 'Essence' for Princess Kakyū/Kakyuu ( delight046.deviantart.com/art/… ), on the "Senshi Royalty Project", too. Pluto was completed and uploaded today. Chibiusa may have to wait till next week. Will Prince Endymion be included, too? I could make the Shintenou a project on their own. They dont really have planets or heavenly bodies that give them power. Yaaaay~ I'm glad you like it!